• Interval (minutes): This is the frequency at which the auto-save takes place. • Inactivity Interval (seconds): When Auto-save is about to take place, it verifies if you are drawing or doing anything in the application. If so, Auto-save waits this number of seconds before attempting another save. • Ask Before Saving: Before performing an auto-save, the system will prompt you with a message to confirm if you want to save or not. You can choose to turn off this option. • Enabled: This enables the Auto-save feature. If you do not want the system to automatically save your work, deselect this option. The auto-save is off by default. Automatically Save Workspace: This option is enabled by default. Every time you add a view to your workspace, remove a toolbar or change a view’s width, these modifications are saved when you quit the application. If you do not want the system to save these modifications, disable the preference. This preference does not require you to restart the application. 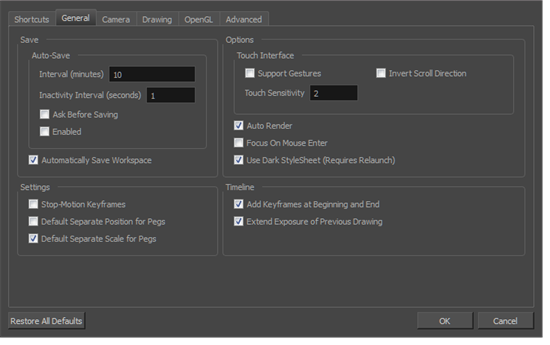 • Support Gestures: Enable the gestural touch interface for the OpenGL views. Note, on Mac OS, this determines whether a 2 finger drag gesture is interpreted as a zoom or a pan. • Invert Scroll Direction: Invert the scroll direction. • Touch Sensitivity: Control touch sensitivity. On Mac OS, higher numbers give a slower response to pans. On Windows, higher numbers favour scale/rotates over pans. Disabled by default. In Toon Boom Harmony, for the operations or keyboard shortcuts to work in the view in which you are working, the focus must be in that view. When the focus is on a particular view, a red rectangle appears around its frame. You must click in the view or on the view’s header for the focus to be done. If you enable the Focus on Mouse Enter preference, you will not need to click in the view to get the focus. It will be done as soon as your mouse enters the view. NOTE: If you enable the Focus On Mouse Enter preference, certain operations from the top menu may not be available since the view focus may change as you make your way to the top menu. In this case use keyboard shortcuts and quick access menus (right-click menus). Auto Render: Automatically enables the Auto-Render option.